Marketing flash mobs peaked with T-Mobile’s famous “Life is for Sharing” series in 2009, but they are still going strong. Samsung did one earlier this year. My local farmer’s market staged a flash mob. There’s even a turnkey flash mob agency. 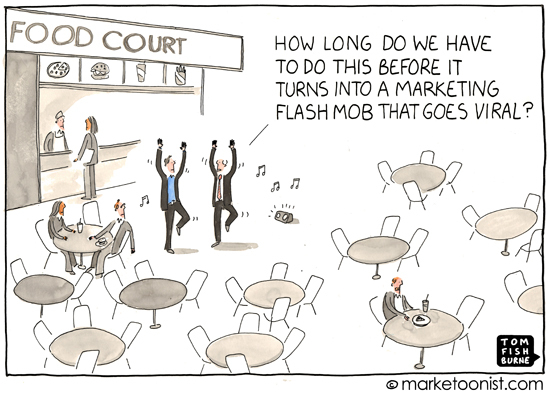 The flash mob is symbolic of the mob mentality of marketers trying to go viral. Marketers see the 38 million YouTube views of T-Mobile dancers in Liverpool Street Station, and want to replicate that for their brands. What marketers sometimes forget with flash mobs (and every other marketing tactic du jour), is that the more commonplace a tactic, the less chance that it will break through. Flash mobs are striking the first time you see one. It’s not enough to copy exactly what has worked for other brands. Part of what worked for T-Mobile was the clear link to the message of their campaign, “Life Is For Sharing”. It wasn’t a flash mob for the sake of a flash mob. The flash mob was a means to an end. 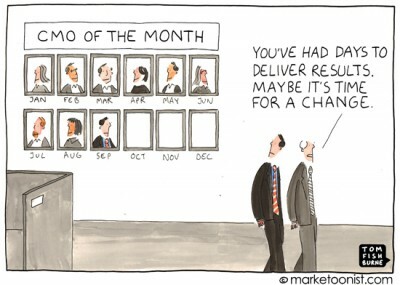 The moment a marketing tactic becomes “turnkey” is the moment it loses what made it remarkable. 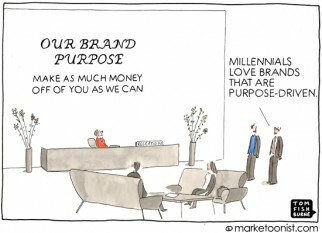 To create marketing worth sharing, we can’t follow the herd. Very much agree. In a sense viral marketing is very similar to understanding consumer desire for luxury goods. Part of the desire stems from others simply not having them (in this case not having seen or been in a flash mob). And another part of the allure stems from them being exclusive and hard to come by (in the case of the flash mob, it’s getting an invite, or knowing where and when to watch for one). “Going viral” in practice means “I don’t want to pay for it”. We had a client who was asking for a viral campaign and said: “I want a viral campaign, but I want to control what people are saying about me”. As a provider of flash mobs, I can say that this approach is very common. That’s why I engage marketers who contact me in how the flash mob fits into their larger campaign and brand theme. I’m surprised by how few have asked that question before contacting me, but after we have a frank and creative discussion, they definitely know if it’s a fit. That’s why the events we do are a success. Have a campaign theme of harmony? Don’t have a dancing flash mob, have an a capella one. Looking to promote pet adoption? Don’t have one in the touristy part of town just because it’s busy, go for a spot where local families gather. Also, decide how important the video is, and how much for the people who are there. I recently did a survey where we tested various concepts to increase volunteering in our metro area. One of the concepts was Volunteer Flashmob. About six times a year, a flashmob would arrive to volunteer to address a community problem. People who signed up to find out about the projects would receive a teaser text on Wednesday, another on Thursday with a little more information and then detailed information in Friday’s text, including the project, the place, time, etc. This concept tested the lowest of all eight concepts evaluated, with many respondents saying it was “dated” and “no longer trendy. However, the Volunteer Flashmob concept was also very polarizing – either respondents loved it or hated it (closely linked to demographics). The lesson: flashmobs might work – for the right concept and the right target audience! Practical: Publicity-seeking. Who doesn’t want all the eyeballs that go along with virality? Superficial: Cool-hunting and popularity-seeking. Many brands (and brand people) want to be associated with something that’s flashy, popular, and trendy. But aping others by mindlessly adopting a hot new technique is Seth Godin’s Meatball Sundae, and it can backfire. Deeper: Wanting to matter, creating something that delights people and spreads naturally. In addition, marketers are starting to recognize the power of the arts to connect with people in fresh and undefended ways. When “flash mob marketing” is prompted by superficial motivations, it’s likely to be a dud. You may briefly entertain a local audience, but the inauthenticity and self-serving nature of the effort will limit its appeal. But if you turn off the “me me me” and think about enlisting the arts in imaginative ways to convey a real (non-commercial) message that aligns with what your brand stands for, you may well come up with something that captivates people and makes them want to spread the word. I like the “magical” effect a flash mob has on the crown around them. To me it says “break free of your everyday lives, there is more than you know going on around you”. The reward should be in the “effect” it has with people, not the viral video aspect. If anyone wants to commit to doing 1 flash mob / week in their city for a year, and for the purpose of bringing a message to the city and world, then I would say they would be successful branding the RIGHT message to their service or product. I’ll admit to enjoying the YouTube videos and appreciating all the hard work and thought that goes into producing a flash mob. However, as a big giant introvert, my first instinct at realizing I’m in the midst of a flash mob would be run fast, run far! Am I the only introverted marketing person here?! That one of the commenters is a “provider of flashmobs” is beyond ironic. Peak Morissette in fact.